When you’re young and the world was a more greener innocent place, Saturday nights was held in suc hhigh esteem, in part due to the power of television. The UK was greeted by someone hosting a house party, “our Graham” and a Scouse lady trying to pair off the single people of the country and also this – muscle-men and muscle-women in tight lycra fighting off the peons of the land in one great spectacle. 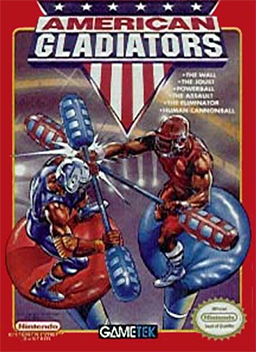 With AWOOGAS here and the Wolf there, Gladiators was an important aspect of any childhood of this generation which was ripe for being in a video game. 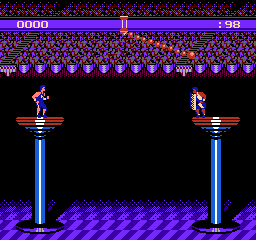 The UK did not get the joy of a Gladiators video game however those fine folks across the pond got American Gladiators on NES so how does it fare up – is it a hearty awooga or a-waste of time? Your character whose dressed in royal blue has to pugle fight his way through a number of Gladiators, mashing the d-pad and the B button in order to knock the Gladiator off the stage. After you knocked the Gladiator off you have to jump on various platforms with the A button until you reach the next Gladiator. This is all against the clock so you have to mash that button and be as powerful as a snake eating a tub of butter. 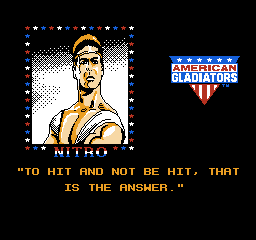 Defeat 4 of the Gladiators and you win the stage, twirling it like a cotton bud (or Q-tip for those across the pond). Sorry, should have said **SPOILERS** – you twirl the pugle around at the end. Sorry about that. #notsorry. 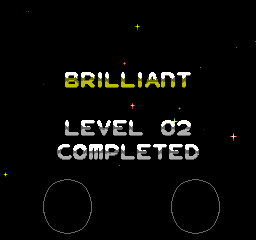 Not the hardest mini game but has solid controls. Bring on the Wall!! Well, a yellow-bricked wall where you mash the A and B button like you’re competing in the final of Track and Field whilst pressing the d-pad in the corresponding direction. Oh yeah, to try and put you off Gladiators swarm around you – if they touch you then your character falls off. No safety net. Mashing the A and B buttons will cramp the hand or your fingers and at times you need to be precise in where your character goes – the bricks on the wall are unforgiving. A more challenging mini game. Your character jumps on what looks like a firebar from the Mario Series, to which this swings until you press the button and your character jumps. To what purpose? Who knows, tried making the character jump before the platform and he fell in. Tried making him jump afterwards to jump over the Gladiator but if you hit the platform you bounce straight off. Jumping off the firebar is with the A button but without an instruction manual it is difficult to know what to do. You could have patience and maybe with luck you would get how this minigame works but this one is lamentable and should be passed. No, not the lottery but Powerball – similar to a game of Bulldog but you run from one side of the screen to the other to collect a ball to then deposit this in one of 5 baskets around the pitch or field. 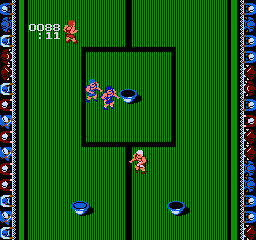 Frustration doesn’t begin to describe this minigame – the Gladiators are unpredictable, they are faster than your character and in fact your character doesn’t fight back – you have to dodge the unpredictable Gladiators which is not easy. If they touch you once whilst you hold the ball, the ball flies off and you have to grab it from the other side of the screen. The worst aspect? The colours – dear me the colours and the background give you two things – a headache and nausea. Words cannot begin to say the effect the background has on your eyes (screenshots do not do this justice) so good luck not having paracetamol after this infuriating game. The music? Dreadful. Avoid. A man in a tank firing cannons at you which you have to dodge in order to win the round. 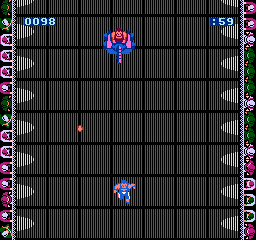 The round is long – not quite as long as a round of Ikari Warriors but bad enough, and the Gladiator’s cannon fire is unrelenting. The A and B buttons again don’t work, like Powerball it is all about reflexes and speed which doesn’t come easy and the background, it’s just as nauseating as Powerball. Wear sunglasses, look at the horizon just don’t look at the background whatever you do. 3 hits on this one and you lose a life so be careful. Experience with multi-event games have left this reviewer feeling disappointed, as most multi-events game are mediocre at best. 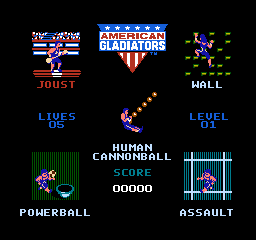 American Gladiators is no different – five events of which two will give you headaches, one is not playable and the other two are button mashing exercises. In some ways it is like being on an episode of Gladiators which can be physically and mentally though. It must be said that without the instruction manual, a mini-game like Human Cannonball is difficult and frustrating, but the last two mini games noted above will make you wish you hadn’t reminisced to Saturday nights gone by and played something better instead. The background colours are headache-inducing and naff, the background music sounds like squealing insects being burned by the power of a magnifying glass on a sunny day. What happens when you win all 5 events? That is the power of YouTube because honestly, it was bad enough trying to play this game for more than 20 minutes without feeling frustrated (in a bad way) and wanting to lie down through exhaustion. The only redeeming feature is the two player option…oh wait, no it isn’t. Do yourself a favour, pick up Action 52 instead because 52 mini games in one can’t be bad can it?…. Playing the NES, or any console for that matter, there are times when you wish you could actually be the character you’re controlling on-screen, be it an Italian plumber who headbutts bricks, collecting gold and having pet dinosaurs. Maybe you want to be a Rambo-type character with a big machine gun, a knife the size of an umbrella and a headband going round killing bad guys. 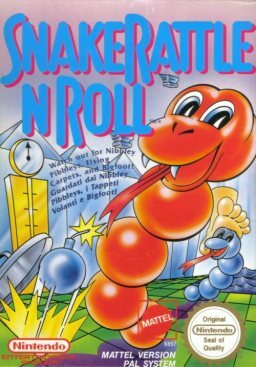 But it never occurred to be controlling a snake but would you believe it, those guys and girls at Rare go ahead and develop a game where you’re controlling a snake. So how did this game fair up, was it rattle and roll or toilet roll? Your snake grows in length when it eats a Nibbley, but the length in which your snake grows (no sniggering at the back) depends on what colour Nibbley you eat. If you eat a Nibbley of the same colour as your snake (bearing in mind Rattle and Roll are purple and pink) then it grows slightly longer. If you manage to eat a yellow enemy then your snake grows even longer – imagine the excitement! When your snake reaches a certain length, it’s tail flashes meaning you can exit the level so be on the lookout. 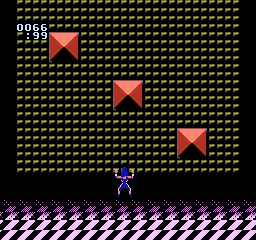 The game features 11 levels set from an isometric perspective (at an angle to you and me) that is similar in camera view to Marble Madness. 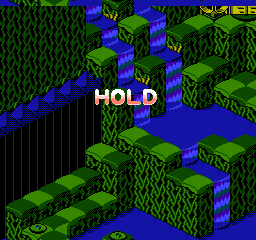 What is also similar to Marble Madness is a strong bold colour scheme and also the control system. Because of the isometric viewpoint, it is not a simple case that you press the right button on the d-pad and Rattle (or Roll) goes to the right. In fact, when you press right on the d-pad your snake goes diagonal down right. If you press diagonal down right on the d pad you go straight down. It is a control scheme that you have to get used to – at least with said Marble Madness you could choose whether to control at a 45 degree angle or 90 degree angle, but with Snake Rattle ‘N’ Roll you have to use the control scheme that the game provides you with. However, when you do get used to the control scheme, you find yourself playing a decent platforming game with a simple premise that you can’t help but enjoy. Along the way you find enemies such as jumping tyres and if you are in the water long enough you might encounter a shark to gobble you up so you have to navigate your way through the enemies if you are going to survive. As well as the enemies, you have to contend with the environment, with it’s hills and spikes that can provide damage to your snake. With this game, you don’t have a health meter such as Mega Man, or go from being a big snake to a little snake, to death. No, when you take damage from an enemy then you lose part of your tail (that you have eaten), and when you lose all your segments of your tail then it is game over however you do have continues to, well continue the fun. With the controls, the d-pad controls have already been discussed, with the A button making your snake jump and the B button making your snake use his tongue, to gobble up the Nibbley Pibbley’s and to attack the enemies. 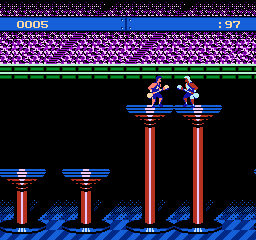 As noted with the graphics, they are bold and well defined – it is a good palette that does the NES justice. As it has been mentioned before, you can have a game with great graphics but the gameplay might be poor, so what is the point? On the other side you could have a game that is of poor quality and great gameplay like Action 52…. In terms of music and sound effects, for a NES game it is of a decent quality – in fact you may recognise parts of it, as part of the music is taken from a song from the 1950’s and also when your snake is in the water, the music pays homage to Jaws by playing music similar to it. So you don’t need to break out the Greatest Movie Soundtracks vinyl out and put it on the gramophone, the music in this game will make you want to save the 45 for another day. 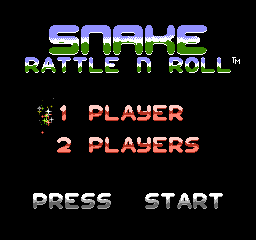 Overall, Snake Rattle ‘N’ Roll is a gem worthy of being in any NES collectors collection. The drawside of the game is the lack of choice with the control system in terms of the d-pad – it would be nice if as per Marble Madness you could choose whether the control scheme is at a 45 or 90 degree angle. If you can overlook this, then you find yourself with a decent platforming game where you cannot just dodge everything that comes your way – you have to swallow the Nibbley Pibbley’s and attack the enemies for more Nibbley’s. 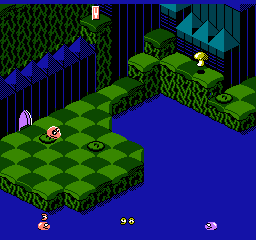 Located throughout the game are lids (in the shape of manhole covers) in which players can open to uncover Nibbley Pibbleys, items and extra lives, entrances to bonus levels, and sometimes enemies. Copies of the game are plentiful and can be found in any retro game store or on your favourite online auction house, so do yourself a favour, shy away from the plumber’s and men welding weapons, pick up a colourful snake and go hunting for the cutest-named enemies you find on the NES.